These are general options which let you customize how SizeMeNow behaves. 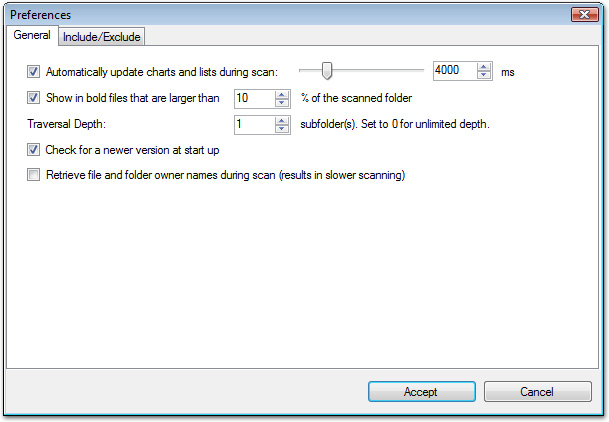 Auto Update During Scan: If checked, SizeMeNow will update all of its lists and chart while it is scanning a folder or a drive. Note that this slows down the scanning somewhat, depending on the update interval. Update Interval: The update interval, in milliseconds, which determines how often are all charts and lists updated during scanning. Note that the lower this value, the slower the overall scanning will be. Show in Bold: If checked, SizeMeNow will show the largest files or folder in bold in the Details View. This often helps quickly determine what uses up the most space in a given folder. % of Scanned Folder: If the above option is checked, files or folders which take more than this percentage value of their parent's overall size will be highlighted. Traversal Depth: Determines how many levels deep the children of the folder being scanned are displayed. For example, the value of 1 will cause SizeMeNow to include only the immediate files and folders contains in a folder being scanned into the Details View and the charts. A value of 2 will force it include the files and folders contains in the immediate children, as well, and so on. A value of 0 will include all files scanned. Note that the larger the value, the slower scans will be. Finally, a value of 0 is the slowest. Check for a Newer Version: If checked, SizeMeNow will verify whether an updated version of the program is available, and if so, pop up a message informing you of the fact. If unchecked, no version verification is done, although you can still do it manually from the Help main menu section. Retrieve File Owner Names: If checked, the owner names for each file and folder will be retrieved and included in the appropriate column in the results. If left unchecked, the "Owner" field will be left blank. Retrieving owner names slows down scanning by approximately 30%.